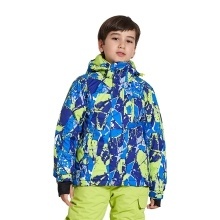 This ski jacket can keep your kid warm and comfortable when he/she is skiing, snowboarding or taking part in other winter sports. Fleece-lined collar for warmth and comfort. Hidden pocket on the sleeve. Windproof cuffs with thumb holes. Powder skirt with snaps prevents snow getting inside. 1. This jacket size information is just for reference only. Please check the detailed measurement above to choose the correct size, and allow 1 – 3cm (0.4 – 1.2") differences due to manual measurement, thanks.